NEW YORK -- A piece of head gear worn by presidential candidate Donald Trump created a significant amount of political buzz last week - and it's for sale in New York City. Trump first wore a white ball cap with the statement "Make America Great Again" written across the front of it when he gave a campaign speech at the U.S./Mexico border in Laredo, Texas. 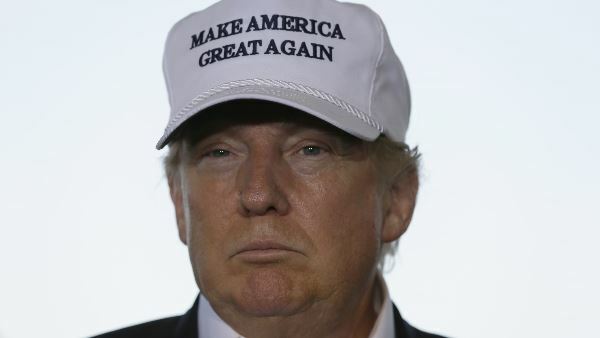 The only thing that could make Trump's hat more awesome is if it were written in Comic Sans. Well, fans of the hat can now get their own. It's for sale at Trump Tower in Manhattan - but the first round sold out. The hats are being sold at the "Trump Store" at Trump Tower on Fifth Avenue in Manhattan. On Saturday, a worker said the store didn't have any more in stock, but an order of 1,000 had been placed and are expected to arrive early this week. Several hundred hats had originally been ordered and sold out within a few days, the worker said. The hats are placed in a Trump-style gold shopping bag, the same as any other merchandise purchased from the store. The price is reportedly $20-25. In the meantime, T-shirts with the same slogan are readily available in the gift shop. Is this hat something you'd buy? Tell us in the comment section below.